Attic Ladders - Page 3 - Industrial Ladder & Supply Co., Inc.
7 Locations to Serve You! We have consolidated to one website to ensure the best possible service. Thank you! 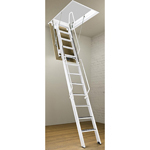 Fakro 62064 LXH- 29'' Attic Ladder Handrail The LXH handrail makes using the attic ladder easier and safer. It installs on either or both sides of the top segment of the ladder. Compatible with attic ladder models LWN, LWP, LWT, LWF, OWM, and LMS. Fakro 62027 LXS Ladder Ends | 1 pair FAKRO LXS ladder ends finish the look of FAKRO wooden attic ladders. The LXS add stability and protect delicate floors. Compatible with attic ladder models LWN, LWP, and are included with models LWT and LWF. Fakro 62064 LXH- 25.5'' Attic Ladder Handrail The LXH handrail makes using the attic ladder easier and safer. It installs on either or both sides of the top segment of the ladder. Compatible with attic ladder models LWN, LWP, LWT, LWF, OWM, and LMS. Fakro Series LWN-0P Wood Attic Ladder | 300 lb Cap. We take your credit card information security seriously. Leading-edge encription technology and Secure Socket Layers (SSL). © 2019 Industrial Ladder & Supply Co., Inc. All Rights Reserved.